offered to meet your needs. Looking for a dentist with the right background, specialty and personality to fit you? Find your ideal dentist from our list of their locations. All of the doctors in our offices accept most insurance plans. We appreciate your confidence in us and take pride in having the opportunity to provide you with the most complete dental care possible. We will do our best to ensure that you are afforded the most optimum health care throughout your lifetime. Each member of our staff, including the office management and support personnel, is trained and committed to ensuring that your visits are pleasant and comfortable. 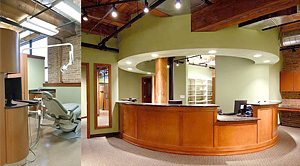 To Provide our patients with the most personalized and complete dental care possible. To Care for our patients with visits which are convenient, pleasant and comfortable. To Educate our patients and the community in preventive dental care.